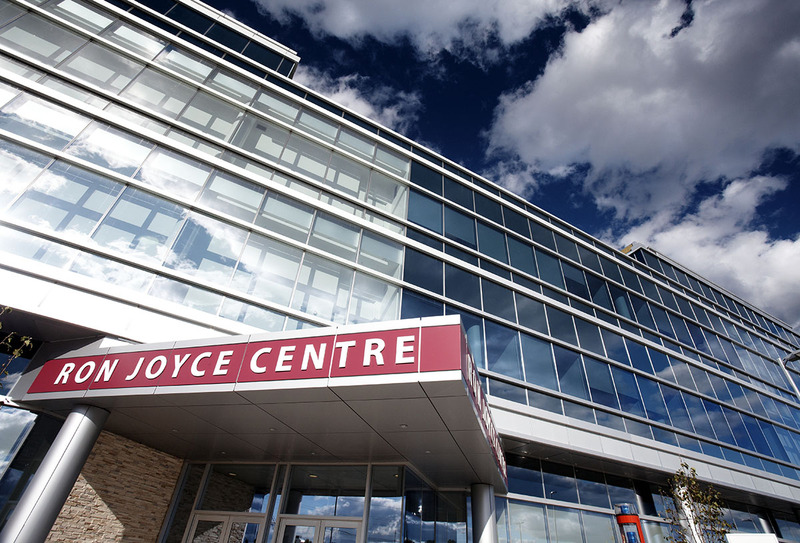 The Ron Joyce Centre is the home of the DeGroote School of Business’ MBA and executive education programs. The facility and its programs form a hub for academic and economic collaboration in Burlington and the Halton Region. It plays an important role in building a knowledge economy, strengthening the local business environment and attracting new investment to the community. Opened in September 2010, the Ron Joyce Centre (RJC) is a four storey 90,000 square foot building housing state-of-the-art classrooms, meeting spaces and lecture facilities. The third floor of the building focuses on executive education, providing a wide variety of education opportunities to business clients in the Greater Toronto Area and Golden Horseshoe. The fourth flour is dedicated to the Digital Transformation Research Centre, Executive MBA in Digital Transformation, and the Health Leadership Academy. In keeping with DeGroote’s commitment to corporate social responsibility, the Ron Joyce Centre incorporates a number of environmentally conscious measures and is targeting a LEED rating of gold. The Ron Joyce Centre has been designed specifically to meet the needs of graduate management students and executives. With input from current students and industry benchmarks, the facilities provide a learning environment reflective of that used in leading corporations. Spaces within the Centre have an open and flexible design to promote the best learning environment and accommodate various uses. These spaces enrich the student experience and facilitate collaboration. The Ron Joyce Centre’s integration with McMaster University is reflected in the educational approaches and even in the design elements of the building. From the experiential learning programs and evidence-based approaches to the stone walls and collaborative spaces, the Centre embodies the best of McMaster.